Where to place the device delivery catheter? To Coil or Not to Coil? A note of disclaimer can’t be avoided here — as you all know, at the present time, for 10 Pipeline operators there are 20 opinions on how to deploy it. Such a state is true of all techniques, particularly new ones. What follows is our way, from technical and strategic viewpoints. I can only say that it works very well for us. a) if the landing zone is larger than 5.25 mm diameter, a larger diameter stent such as a 6 mm Solitaire FR, Precise, Wallstent, or a carefully delivered covered stent can be used to tack down a pipeline to the larger wall, however this may increase the risk of endoleak if an uncovered, relatively high porosity stent is chosen for the mission. Unless a covered stent is utilized, using the Pipeline where the landing zone is larger than the device is not a good idea. The ophthalmic artery is likely to be one most often covered by the Pipeline. About 20% of covered ophthalmics in our experience are closed on a 6 months follow up angiogram. All are asymptomatic (except one case of questionable momentary amaurosis); the ECA takes over the vessel. 1) NeuronMax, Navien 058, and Marksman. A small profile coil catheter can go between the NeuronMax and the Navien. 2) 6F Shuttle Sheath, 4.3 DAC, and Marksman. A small profile coil catheter can go between the NeuronMax and the DAC. The fit between the DAC and the Marksman is rather tight. There are other possible solutions. The important point is to err on the side of more support. Beware of skipping the distal support catheter unless you are an experienced user. For the posterior fossa, we typically use a short Shuttle (80 cm) in the subclavian, with a Navien 058 or Neuron 053 as high up the vert as safely possible. The DAC and Penumbra family of catheters are also very reasonable choices. 3. Most groups use an .014 guidewire inside a Marksman or another .027 catheter, which will of course accommodate an additional .010 buddy wire, and this can be very helpful on occasion. Large-Giant aneurysms will frequently require loop-to-loop catheterization. An .018 wire, such as the double-angle Terumo can be very useful also. Reducing the loop following successful distal access is usually a good idea. The device will likely want to prop itself against the posterior dome of the aneurysm as it is delivered, such that one might need a greater device length than anticipated even if one is planning to bridge the neck with a single device. While the primary operator or operators deploy the device, an assistant should keep an eye on the leading guidewire vis-a-vis perforators and kinks. There is not much to be done about it prior to capture coil detachment, however afterward the wire can be manipulated into a better position. To this end, it is a good idea for one of the biplane views to be selected such that the expected position of the leading guidewire zone is well-seen. Here, the guidewire drops into the anterior temporal branch, and is repositioned following device detachment from the capture coil. In contrast to laser-cut devices such as the Neuroform and Enterprise, which are constrained within their delivery sheaths by collapsing the stent to its minimal diameter and maintain their lengths on expansion, the Pipeline is loaded into the delivery system by the action of elongation to about 2-2.5 times the indicated size. Therefore, its deployment requires expansion and foreshortening, and pushing the device out facilitates expansion. On the other hand, unsheathing simply uncovers the pre-stretched device without allowing it to expand to its desired diameter. Thus, predominant unsheathing, which is the appropriate for delivery of laser-cut stents, is NOT the right action for delivery of the Pipeline. Devices deployed in this fashion are ALWAYS stretched, and therefore have a tendency to foreshorten with time, in some cases enough to entirely come off the landing zone and prolapse into the aneurysm, and generating reports of delayed device “migration”. One common scenario where tendency for unsheathing is particularly tempting is when one wishes to bridge a long neck with a single device, which leads particularly to stretching of the proximal end. The device will tend to foreshorten in time, either immediately or in delayed fashion after the procedure, and may on subsequent imaging (or following an unfortunate clinical change) be found to have “migrated”. In fact, the device simply behaved according to its geometric and physical properties. Below is an illustration of what happens under such circumstances. Once the delivery catheter is appropriately positioned and working angle roadmaps are obtained, the device is advanced within the delivery catheter until it reaches the desired distal deployment location. The device will spring back somewhat following its release from the capture coil (it opens and foreshortens) and therefore you may want to advance the capture coil a bit past where the edge of the device should ultimately oppose the wall. For example, if you wish to just miss the PCOM ostium so as to leave it completely uncovered, you could nevertheless position the capture coil partially over the ostium, knowing that the distal device edge will recoil anyway. Although the predominant delivery action is to push, the initial portion of the device is typically unsheathed — until enough of the device opens up to allow for something to push against. This unsheathing results in a cigar-shaped configuration which is synonymous with elongation — not appropriate for later delivery stages but usually the desired initial action. About 1/3 of the expected length can be unsheathed this way, while maintaining position of the capture coil. Circumstances will dictate when to transition to pushing — for example, if the capture coil is already against a curve (i.e. anterior genu), pushing can start earlier as there is something to push against. Not infrequently, the device will pop off the capture coil during unsheathing, which is of course excellent news, as seen below. From this you can see that the capture coil is a continuation of the wind around the delivery wire which makes up the leading guidewire segment. The wire is wound in a counterclockwise orientation, and the distal end of the device is inserted into the capture coil. As the device opens during delivery, the forces acting on its distal tip create a tendency for the distal portion within the capture coil to slip from under it, i.e. to detach itself and open spontaneously. This does not always happen. Factors which influence capture coil release include device diameter (larger diameter devices tend to exhibit less robust spontaneous opening), device size relative to parent artery (oversized devices have less radial force at chosen vessel diameter and are less likely to open), location of capture coil (straighter segments tend to promote opening), mode of delivery (unsheathing results in stretched devices, which have little radial force and are less likely to open), and the amount of device underneath the capture coil (which is slightly variable). 1) Is the device appropriately sized to the arterial segment in question? In other words, is the device too oversized? If so, consider removing the whole assembly now, before its too late, re-accessing, and using a more appropriately-sized device. 2) Is the device stretched? Was there enough “pushing” done or predominantly unsheathing — i.e. stretching? 3) Is the capture coil stuck in a curve? If so, pull it back by pulling on both delivery wire and delivery catheter, and try again. 4) Is the distal support catheter as close to the action as possible — having your Navien or other such catheter closer to where the PED is helps translate torqueing better and facilitates detachment. 5) Is the device malfunctioning — meaning that all of the above seem to be in order, yet there is no detachment. 1) Push and Torque — push on the delivery wire gently, while rotating the Torque CLOCKWISE. The wind of the capture coil requires to rotate CLOCKWISE. The Instructions for Use (IFU) recommend rotating up to 10 full turns — FOR A GOOD REASON. Do not rotate more than that, unless you want to be holding the end of a broken wire. In fact, if you rotate say 5 times and do not see the distal delivery wire moving, meaning that your rotation of the torque device does not translate into rotation of the capture coil, you might want to stop rotating. In this case, the torque device will usually unwind itself. In many cases, push and torque is all that is required for a device that has not already spontaneously released itself from under the capture coil. 2) Continue delivery (usually by pushing) — sometimes delivering more device appropriately against the walls, without stretching, will promote detachment. 3) Bring the Navien or another distal support catheter over the delivery microcatheter as close as safely possible and try torque and push again. Torque translates better to capture coil with more support. 4) Other than torque and continued delivery under appropriate load, there are few other tricks. Some try to wiggle the device to shake the distal end from underneath the coil. One thing we do not advise is pulling back on the delivery wire. Don’t pull back on the delivery wire at all until after the device has detached from the capture coil! Pulling back only increases the angle between the deployed portion of the device and that within the capture coil, and may bend/damage the braids — aside from possibly breaking the delivery wire. 6) Other than trying option 4, it may be simply best to remove the whole assembly if you feel the device is not coming off the capture coil as desired. This would certainly be the option of choice if the device is too large to begin with, or if you are simply not interested in continuing under the circumstances. It should be apparent by now that deploying the Pipeline is art as much as science. This can be used to your advantage. As an operator, you control how much you want to “pack” the device, when to add extra load, when to let it stretch a bit, etc. With increasing comfort comes the appreciation for the versatility and flexibility of deployment, consistency issues notwithstanding. Here is a movie showing examples of (generally) appropriate and inappropriate loads. 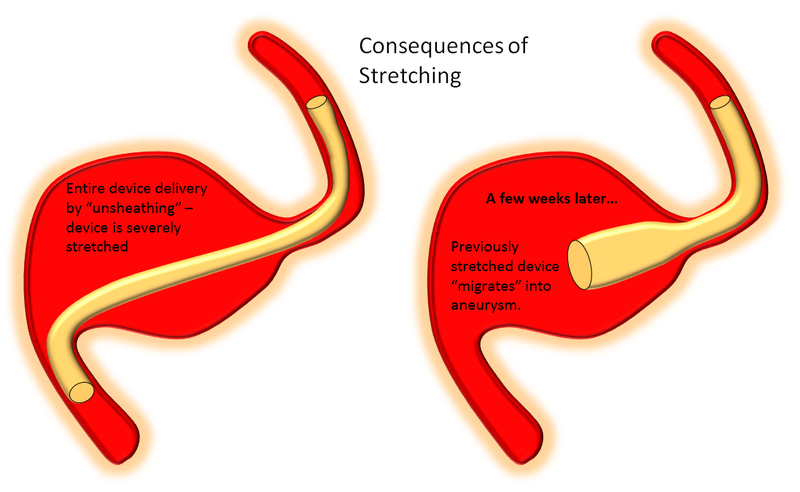 The deleterious effects of delivery by inappropriate stretching cannot be over-emphasized. By now there are several examples in the literature of exactly this phenomenon, usually under the rubric of “device migration”. The two signs — shape of device and location of delivery assembly — tell you how much load exists in the system at any given time. How much is the right amount? — up to you. Generally, for effective pushing, there has to be at least some load present. The manufacturer recommends a “center and push” approach — meaning that the delivery wire should be positioned in the middle of the vessel and device then delivered by pushing. This is very sound advice, which particularly strives to assure that there is at least some load present in the system — not too much and not too little. In practice, however, you will find that center and push tends to produce somewhat too little load for effective “packing” of the device. By the time you are comfortable with the “feedback” from device shape and its packing based on the loads you are applying, you will find yourself ready to vary things according to your specific intentions — at which point drops of rewarding endogenous endorphins may be added to the sea of adrenaline, which is the usual state during pipeline deployment. I doubt it will ever be pure enjoyment — at least not for this generation of the device — but its getting there. 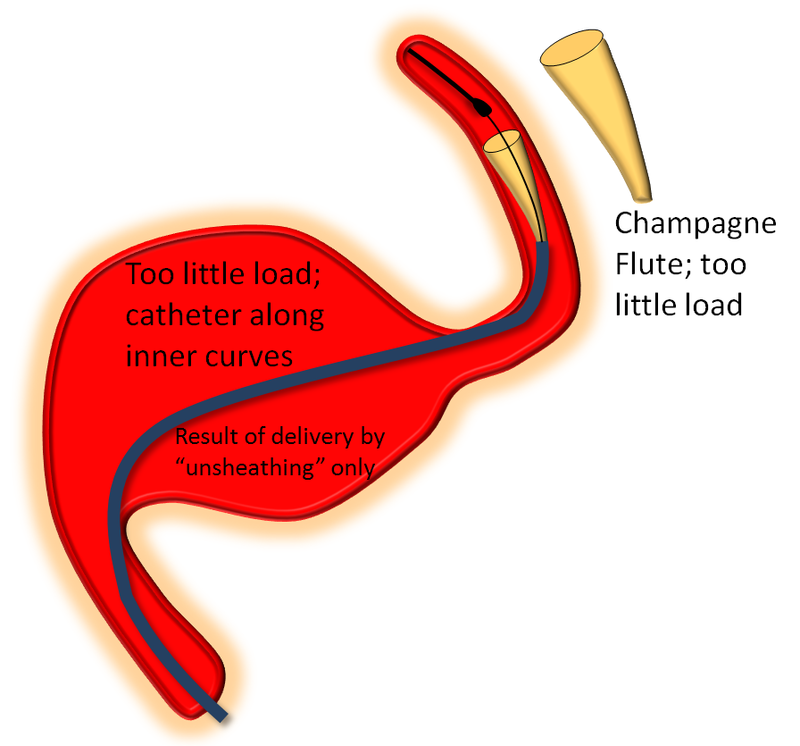 As stated above, load is varied by pushing or pulling on the delivery catheter TOGETHER with the delivery wire. 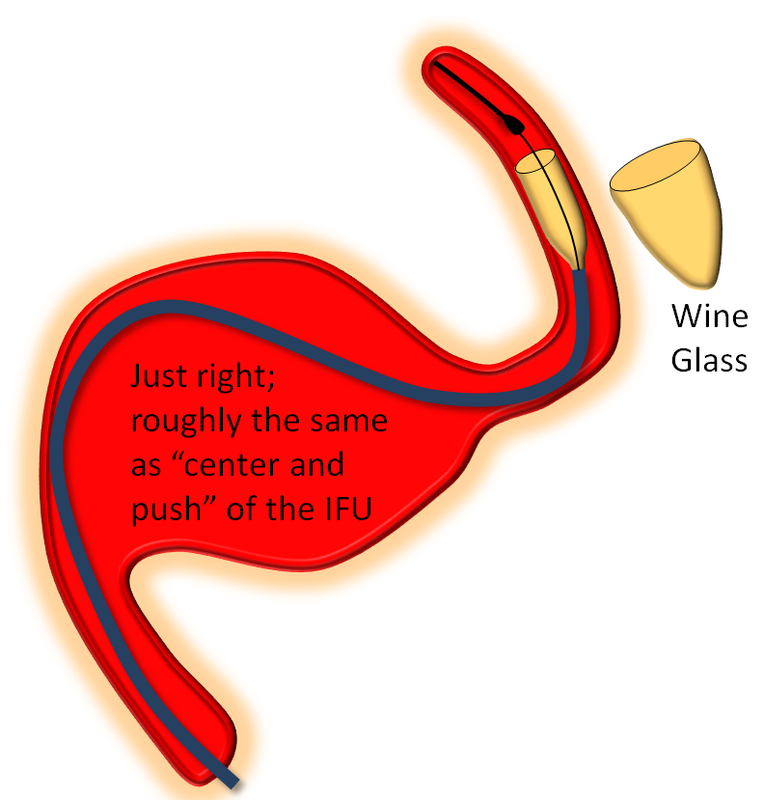 The IFU advises to “pin” the delivery catheter and delivery wire together and advance both to increase load, and pull back to decrease load. It is important to recognize that the action of device delivery, whether by pushing or unsheathing, changes the amount of load on the system. For example, pushing the device out usually results in the delivery catheter traveling back (recoil), which gradually increases the load as more device is pushed out. In other words, the more device is pushed out the more increase there will be in the overall load, all other things being equal. 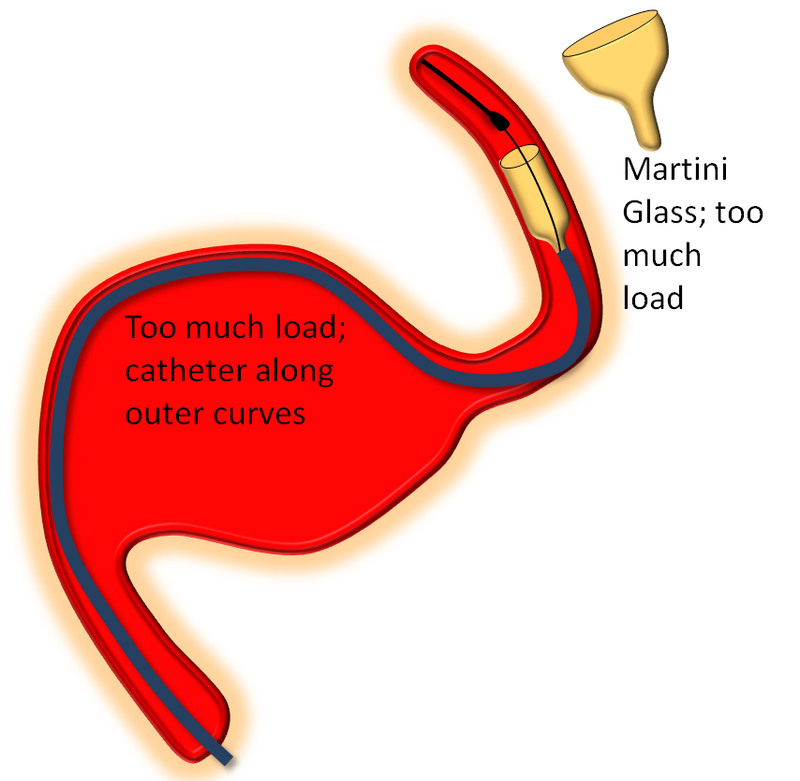 Therefore, particularly for longer devices, the load is typically adjusted during delivery — when and by how much depends on the shape of the device (martini glass is bad) and other factors. In this example, the device is delivered under some load, and does not open immediately, being held by the Marksman. Once the Marksman is pulled back, the device springs open. The final maneuver after successful delivery of the Pipeline is to go back through the opened device with the delivery catheter to re-capture the capture coil — i.e. to place the delivery catheter distal to the device to maintain distal access and to pull the capture coil into the delivery catheter. This is not always straightforward, because the capture coil has an edge which prevents it from advancing into the delivery catheter unless the two are appropriately lined up. The first step is to advance the delivery catheter through the deployed pipeline device. Once the delivery catheter tip and capture coil are in proximity, pull on the delivery wire to see if the capture coil will get in. 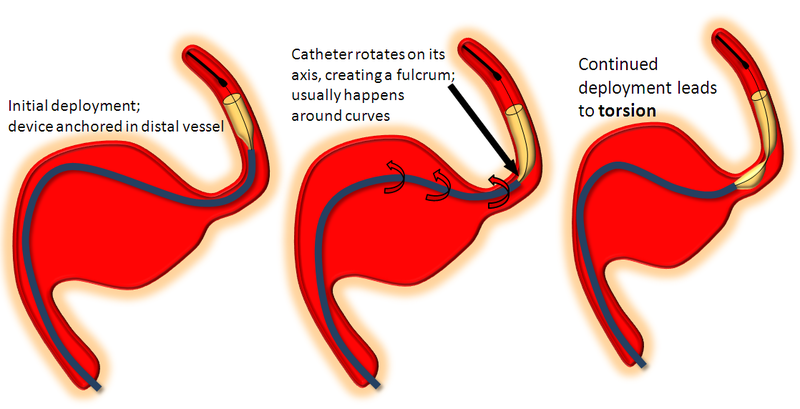 If it does not, it will foreshorten as it is pulled against the edge of the delivery catheter, as seen below. Here are some examples of foreshortening of the capture coil before if finally goes into the Marksman. If you see foreshortening, DO NOT continue pulling on the delivery wire in hopes of forcing the capture coil into the catheter, for obvious reasons. It will not go in. 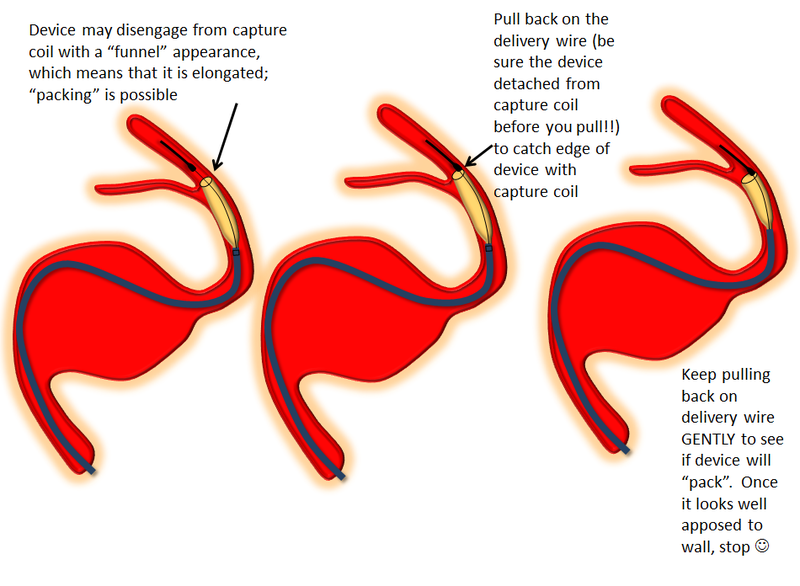 Torque the delivery wire CLOCKWISE as you bring the capture coil into the delivery catheter to see if this will help. If additional devices are to be placed by telescoping one device into another, an identical or larger diameter device should be used. Even when already implanted devices are felt to be oversized, one should be very cautious with telescoping a smaller diameter device into a larger one — there is no reliable way of telling where the proximal edge of the device will end up, and having a free-floating end is suboptimal. In the end, it is a very useful practice to assure yourself that the device or devices are optimally-seated, apposing the walls at both landing zones, with no endoleaks, occult in-stent constrictions or torsions, intususseptions, etc. There are several methods for doing this — such as rotational angiography with contrast injection, Dyna CT with contrast injection, and J-wire technique. Which one is chosen is perhaps not as important as using whatever you prefer consistently and comfortably. We like the J-wire method of forming the J of an 0.014 wire and going back and forth through the construct, watching to make sure the J stays apposed to the walls of the device throughout, with no areas of “catching” or constriction. Our perceived advantages to J-technique are minimizing radiation and potentially streamlining the inside of the construct. Disadvantages include the potential for “breaking” apart the construct or dislodging a tenuously positioned stent. A few movies of the method are shown below. Adjunctive coiling can be done before or after pipeline deployment. After is generally better, as you might not see the Pipe as well after coils are in. Trapping your favorite small microcatheter in the aneurysm is perfectly fine. Trapping larger catheters is up to you… Remember, no wire or coil can get through the interstices of the Pipeline — this is your only chance to coil the aneurysm. Please remember that aneurysms are not immediately cured following Pipeline placement. Some will rupture before they are fully endothelialized, for reasons that we like to categorize as “poorly understood” — although one good reason is that all aneurysms which are not 100% closed are at risk for rupture. 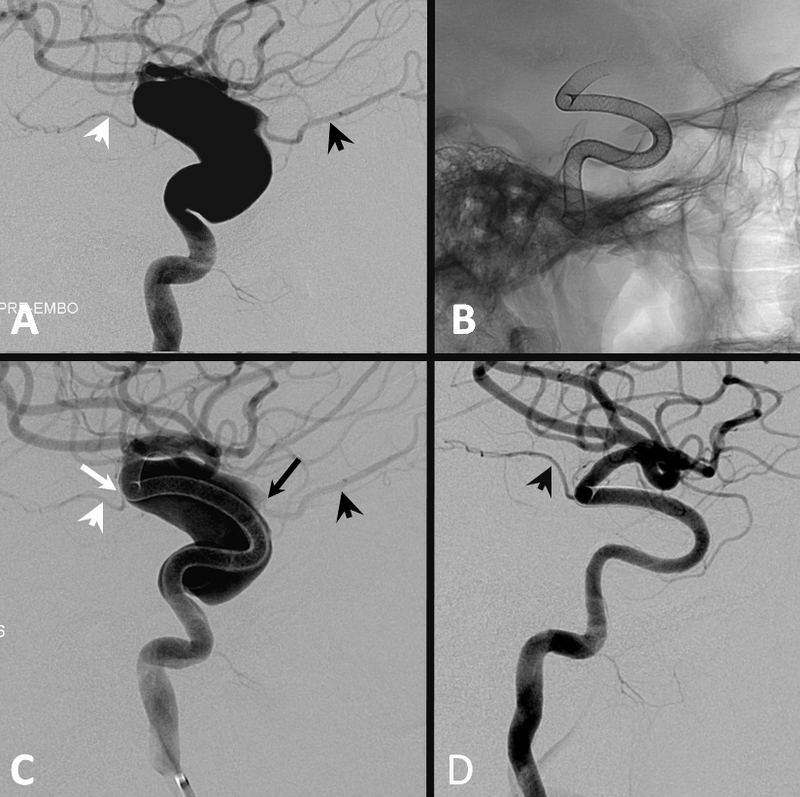 Undoubtedly there are complex flow and thrombus-related changes taking place in “diverted” aneurysms. For these reasons, we have a lower threshold of coiling aneurysms which show growth, possible new symptoms such as regional pain, or just seem to be morphologically threatening. 1) Recognition — torsion is different from ovalization, which is when the device flattens itself around a curve (see movie above). 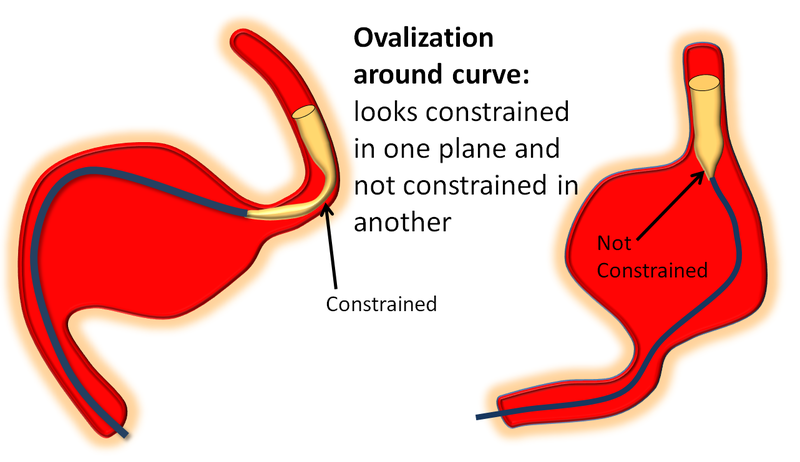 Ovalization looks like a waist on the device in one plane only. Torsion looks like torsion in all planes. 2) Wag the tail — wagging helps lots of things, including torsion. Basically wagging redistributes forces and loads, and promotes opening up the device in its optimal way. Wag a few times and see what happens. 3) Reverse last load/unload maneuver: The delivery catheter likely rotated on itself to precipitate torsion as a result of either reducing or increasing load applied prior to torsion. If you reduced load prior to torsion, increase load and wag, and vice versa. 4) Remove device — if nothing is working to untwist the device, cork and pull. With bad torsion, the capture coil will not go through the waist of the torsion, you may to effectively “cork” it there. As you pull, the torsion will likely undo itself when the proximal end of the device comes off the wall and has a chance to untwist itself. When this happens, cork for real and continue pulling. When you re-access and are ready to continue, consider using multiple smaller devices to accomplish the task, even it if means building a “loop” of device inside a large aneurysm. This may be the only way to go. 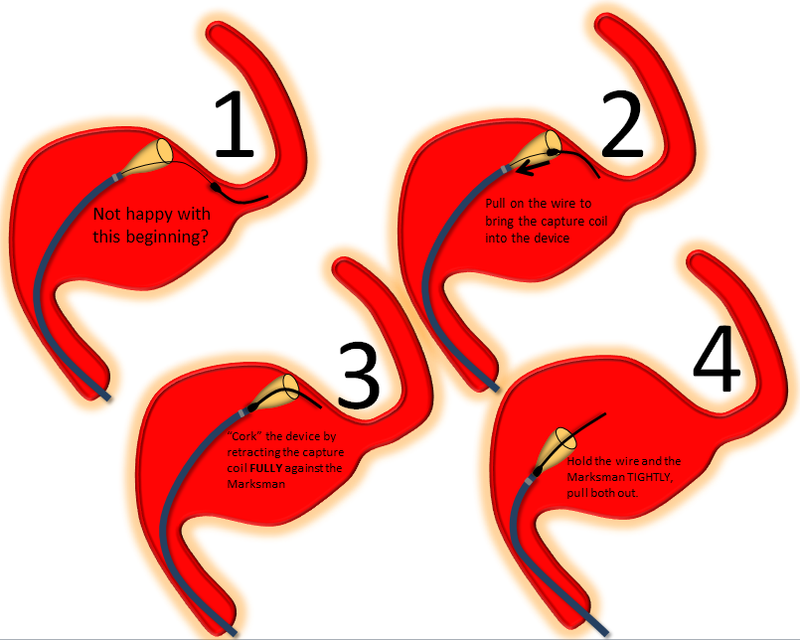 5) Deploy and angioplasty — if you don’t want to pull the whole thing out, and torsion is incomplete, such that it is possible to get the capture coil through it, you should be able to deploy the remainder of the device and then angioplasty the torsioned segment with a high-pressure balloon. Compliant balloons such as the hyperfrom/hyperglide family do nothing to torsion and there is no point in trying them. There are several potential issues with this approach. First, angioplasty might not succeed (have never seen it fail yet though) and you may end up with a “critical stenosis” in a man-made artery. Second, attempting to bring up balloon into a tenuously placed device (say across a large neck) may displace it so that the proximal or distal end will fall into the aneurysm (see movie above). Third, when angioplasty succeeds, it does so by breaking and twisting the strands of the device. This requires using an additional device to overlay the formerly torsioned one. You can guess what is likely to happen there… Use a short device to minimize chance of another torsion. Happens occasionally. The capture coil is off, but device is not fully open. It is relatively straightforward to address this after the rest of the device is delivered. Bring the delivery catheter through the device and push it open. 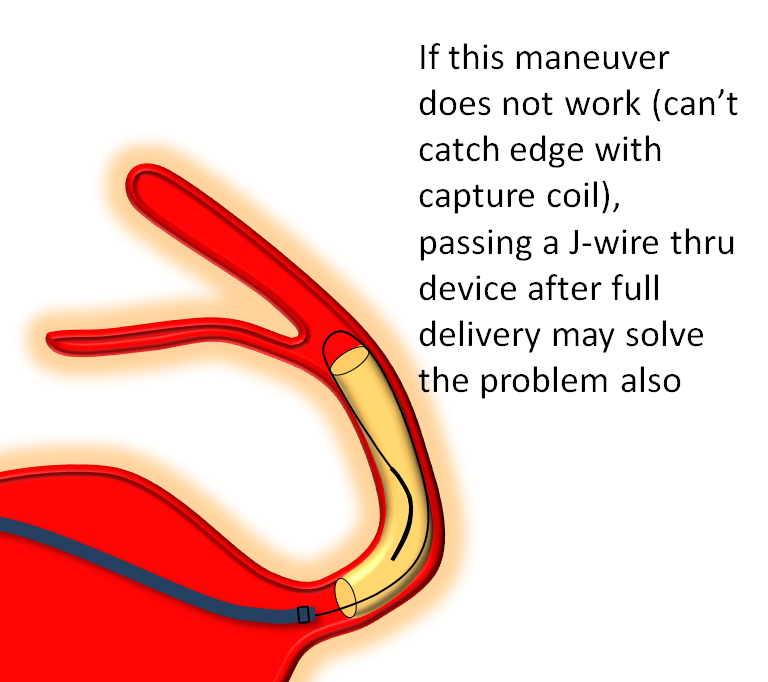 If still partially constrained, use J-wire (see below) or angioplasty (compliant balloon is enough for this). Here is a movie of distal stenosis post detachment. May be either true constriction or a partial torsion. Most of the former are due to excessive unsheathing of the device, without allowing it to fully open. A picture of irregular, narrow device is essentially a signature of improper deployment. Prevention is the best cure. If you see stenosis developing, most likely there is not enough load. Wagging the system after adding load works well. There is often narrowing (ovalization) seen when going around a curve — even when loads are appropriate. Make sure its not a torsion, keep deploying until the device comes around the curve, and wag, wait, and wag until it opens, which is almost always. Occasionally, pushing device out under appropriate load does not produce expected opening. All factors being accounted for, this is some kind of device issue. The answer, again, is the same — go slow and wag — works nearly every time. Typical stubborn ovalization around the curve, being addressed (ineffectively) by wagging the tail. The problem is not the curve, but the initial ascending cavernous segment (which some call “lacerum”), where the device is not fully opened. Persistent wagging eventually does the trick. Happens occasionally, but when it does, it is seriously bad news. Here is a movie of proximal opening failure, despite appropriate loads, etc. If proximal stenosis happens anyway, what to do depends on how bad the situation is. 1) Wagging the tail: helps lots of things. The delivery wire inside the stent, by wagging, contacts the inside of the stent, and may get it to open fully. 2) Bumping with delivery catheter: sometimes “bumping” the device with the end of the delivery catheter is enough to make it open. GENTY, bring up the delivery catheter and apply some pressure on the end of the device (see above movie). If this does not work after several tries, don’t continue or you may bend the end further. 3) Angioplasty: If the constriction is large enough to admit the delivery catheter, go through, capture the capture coil, and place you delivery catheter distal to the stent. From this point, you have many options — such as placing an exchange-length wire and bringing up a balloon — which in this case may be a compliant type — to expand across the area of narrowing. High-pressure balloon will work for sure. 1) Removing delivery catheter while maintaining the guidewire inside — requires letting the entire delivery wire go into the delivery catheter as you pull it out — pushing some saline through the delivery catheter to maintain pressure on the wire as you remove it helps. You can also cut away the delivery catheter around the wire in sections. Once that is done, a 4 mm gooseneck snare is placed AROUND the delivery guidewire, advanced to the device, synched, and device removed. 2) Access from above — if there is a way from above (PCOM or ACOM), then second groin stick, followed by access from above and balloon angioplasty (compliant balloon is enough) works. Do not pull on things too much when coming from above — risks injury to circle of Willis. This method is also available if proximal access has been lost. I would suggest that, if you are in this position, and think the ACOM or PCOM is large enough, you should consider doing a balloon test occlusion of the artery with the problematic pipeline. There are as many BTO protocols as neurointerventionalists. We typically do BTOs asleep, and rely on angiographic appearance to declare passage or failure; I assure you that our results are as good as awake hypotensive challenge and similar maneuvers. This is a minority view, but it has the advantage of allowing us to have more comfort with BTOs under circumstances of anesthesia. If the patient has an apparently sufficient circle of Willis, consider the potential disadvantages of access from above in terms of risks to the contralateral hemisphere — perhaps the better part of valor is to sacrifice the parent vessel. Nothing is working — proximal access lost, from above is impossible, BTO a failure… Options are bringing in an emergency proctor or your friendly pipeline specialist, perhaps a bypass and takedown if sufficient expertise exists, or continuing with stent removal attempts. There is also the possibility of waking up the patient, and maintaining him/her on double antiplatelets and heparin for a week or two — devices with proximal stenosis have been known to open partially on follow-up angio — at least enough to allow for the possibility of balloon angioplasty. Alternatively, flow reduction from unopened device may encourage growth of circle of Willis or other collaterals, thus allowing for vessel takedown at future time. It is probably best, if you are in this situation, to keep heparin on as well as antiplatelets, in proportion to the degree of flow reduction. Managed on individual basis. The first step is to recognize one. Slow bleeds are subtle and may not produce obvious vital sign changes, as seen in images below. 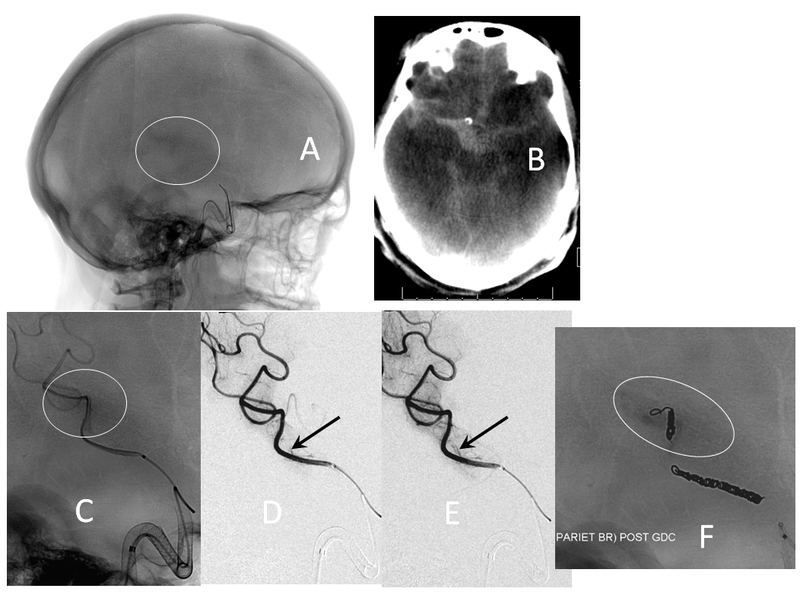 Notice relatively subtle opacity over the posterior Sylvian fissure (A, white oval) on an ICA injection, with corresponding microinjections (C,D,E) showing a small extravasation (arrows), which produced no small amount of blood and contrast in the subarachnoid space on this Dyna CT (B). The devices were already delivered, and so choice made to close branch with coils (F). Patient was recovered fully after 1 month (initial weakness). Leaving in a misdeployed device is usually not advisable. All reasonable effort should be made to safely remove, plasty, or otherwise fix misdeployed devices. Sometimes there is simply nothing that can be done to fish out a device. In these cases, parent vessel sacrifice is probably the best thing to do if there are sufficient collaterals. If not, the patient may be maintained on antiplatelets and heparin to allow for growth of appropriate collaterals. Consideration should be given to arranging for patient transfer to your regional facility with maximum expertise in dealing with these issues. Anti-platelet management: We have not had a single in-stent thrombosis in the anterior circulation after starting to measure P2Y12. Further discussion is outside the scope of this page. Our rate of 6 and 12 month non-occlusion remains identical to PUFS, as is our average stent number per case. Those using less devices will find less cures. The most important thing to make sure when facing a persistent aneurysm is to exclude an endoleak. 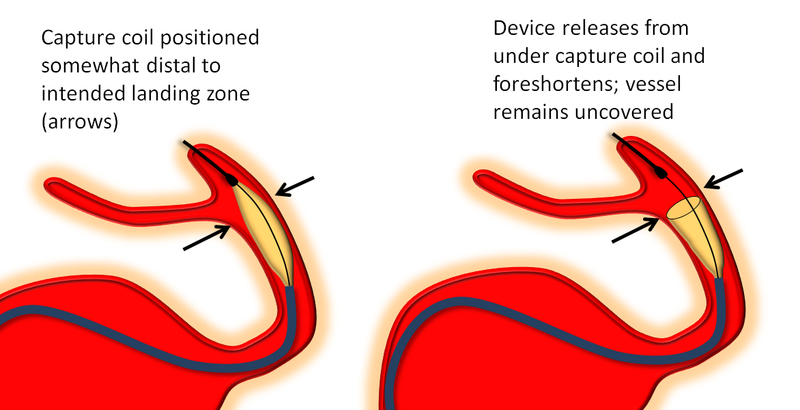 Lack of device apposition at the landing zones leads to endoleak, which keeps the aneurysm open. Look carefully at unsubtracted images and take multiple high-magnification oblique views. If there is no endoleak, we usually wait another 6 months, and if the aneurysm remains open, add more devices. Everything I learned about Pipeline can be traced to the influence of two great teachers– Dr. Peter Kim Nelson and Dr. Tibor Becske. Whatever contributions I made have been influenced by their vision. I am also deeply grateful to Dr. Howard A. Riina for his guidance and support. This page would never come about without the support of our fellows Eytan Raz and Daniel Zumofen. For the purposes of disclaimer, views and opinions expressed on this page are entirely my own. I, Maksim Shapiro, am a Pipeline proctor and per diem consultant with Covidien, the manufacturer of Pipeline. No financial or other support whatsoever was provided by any legal entity, group, or individual towards creation of this page, or www.neuroangio.org as a whole. Pipeline devices featured in ex-vivo images above were donated by Covidien for general training purposes, and related projects. See Disclaimer section for general disclaimer information.